Since I am still holding on to my January Protective Style I figured that I would give you guys a break and talk about my daughters hair for amount. I have 3 daughters. 3 girls with 3 totally different hair textures. For the most part, I keep it pretty old school. No perms of course. They rock beads and ponytails. My middle daughter recently turned 8 yrs old. Her hair out of the 3 is the longest, and most resembles my own. 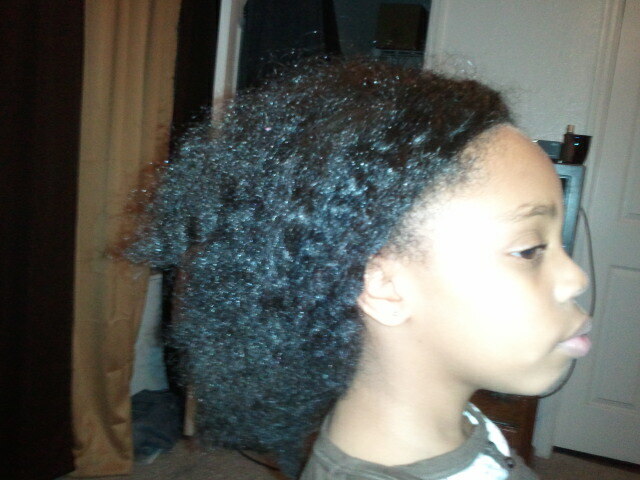 Oh how I wish that I had the length that she does right now! I have grown to LOVE big coily long hair. ..But to a second grader, its not so cool. 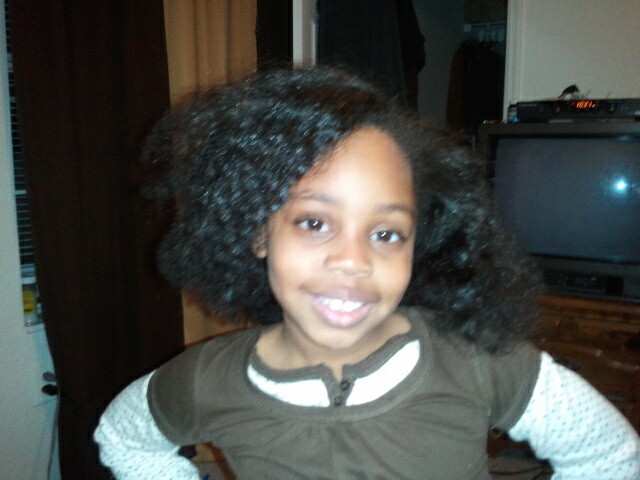 For her birthday and for the first time ever, I decided to have her hair straightened and let her wear it down. 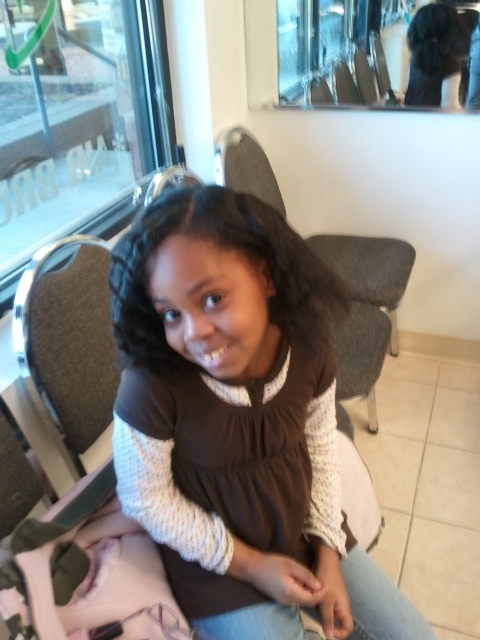 Now unfortunatly when we left the salon her hair was in plats because it rained for 2 days here in Atlanta. Before we began our mommy daughter birthday adventure I took out the plats and loved the way it looked, so her straight look went to her very first braid out…and probably her last…It didnt last a whole day until it was a poofy mess LOL..Now if it was on me, I would still rock the poofy braid out, but again in second grade..not so much So I decided to plat it back up and try the twist out again on Monday morning. I would love to hear from you ladies, how do you style your girls hair? and how long does it last for you? 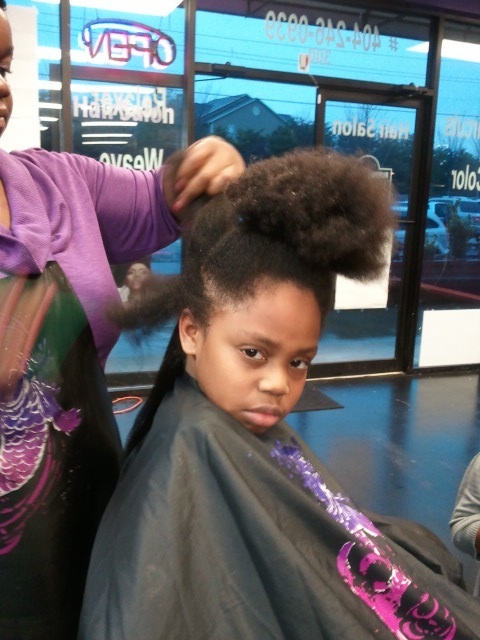 How long did you wear “little girl” hair styles like ponytails or beads? At the Salon getting it flat ironed. Yea, she wasnt happy.. 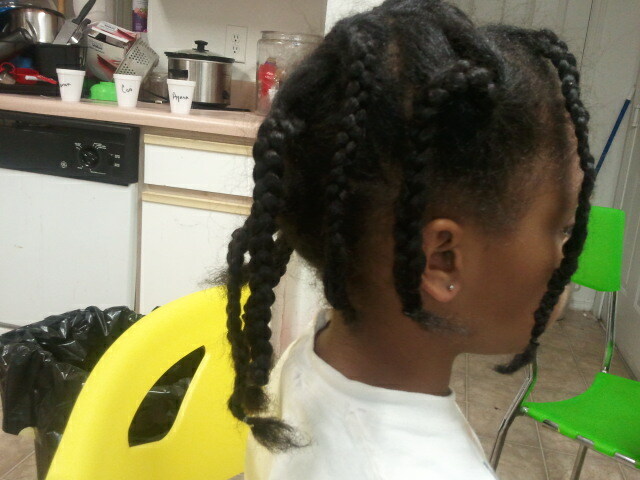 I re braided it and covered it up.